PROVIDENCE, RI--(Marketwire - Sep 11, 2012) - Meller Optics, Inc. is offering IR and broadband optics custom fabricated to match the material and surface characteristics required for the application, in order to provide the best value. Meller IR & Broadband Optics can be fabricated to specification from the optimum material to meet application requirements, based upon wavelength and environmental factors, including surface 1/4 and 1/10th wave surfaces and 10-5 scratch-dig finishes. Offering plano convex, concave, and meniscus configurations, sizes can range from 1/4" to 6" O.D. or diagonal with tolerances to ±0.005" and thickness to ±0.002," depending upon material. 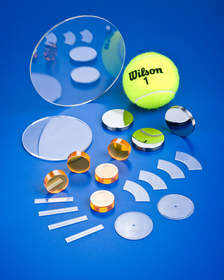 Conforming to MIL-PRF-13830, Meller IR & Broadband Optics can be made from sapphire and spinel for demanding environments, germanium for detector and sensor applications, zinc selenide and sulfide for lasers, medical instruments, and FLIR, calcium and magnesium fluoride for non-hygroscopic front surface applications, and from silicon for mirrors and reflectors. A wide variety of A/R, partial, and total reflective coatings are available. Meller IR & Broadband Optics are priced according to material, configuration, and quantity. Price quotations are available upon request. Founded in 1921, Meller Optics has been providing high quality optics to defense, medical, laser, and industrial markets for 90 years now. Specializing in the grinding and polishing of hard, durable materials such as sapphire and ruby, the company has also developed high-speed, low-cost finishing processes for a variety of optical materials such as laser glasses, fused silica, zinc selenide, germanium, silicon, fluorides, and ceramic materials. Configurations include windows, substrates, lenses, domes, and prisms. Meller Optics is ISO 9001:2008 certified and in addition to providing standard, off-the-shelf products, they custom fabricate components that meet exacting specifications from delicate, difficult to work with optical materials. They also supply quality Microlux Alumina polishing abrasives and Gugolz optical polishing pitch. Meller IR & Broadband Optics can be fabricated to specification from the optimum material to meet application requirements, based upon wavelength and environmental factors, including surface 1/4 and 1/10th wave surfaces and 10-5 scratch-dig finishes.